In last January, I had created a list of Default reports of SCCM ConfigMgr 2012 SP1. 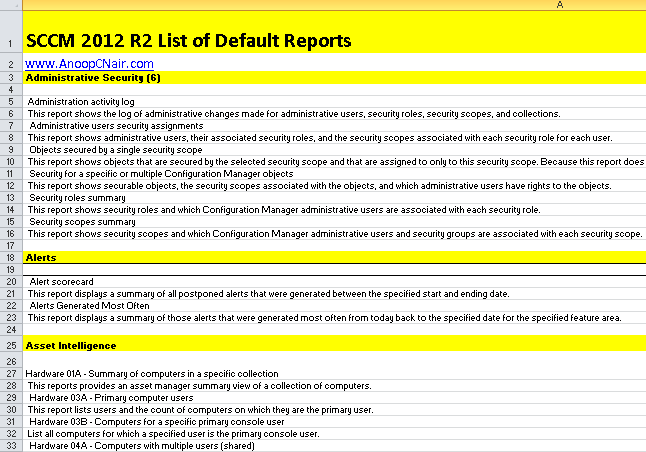 This post deals about SCCM ConfigMgr 2012 R2 list of reports. Along with the list the excel contains the description of each report. We’ve 483 reports in SCCM 2012 R2. There are 59 categories in SCCM 2012 R2 SSRS reports. 3 hidden categories in R2, Endpoint Protection – Hidden , Software Distribution – Application Monitoring – Hidden and Status Messages – Hidden. There are total of 483 reports. I’ve created an Excel spread sheet which can be download from Microsoft TechNet Gallery. Download the Excel spreadsheet from here. There are two sheets in the spreadsheet 1st one is list of reports and the 2nd one is list of categories and total number of reports in each category. This report shows the log of administrative changes made for administrative users, security roles, security scopes, and collections. This report shows administrative users, their associated security roles, and the security scopes associated with each security role for each user. This report shows objects that are secured by the selected security scope and that are assigned to only to this security scope. Because this report does not display objects that are assigned to two or more security scopes, it might not display all the objects that are associated with the selected security scope. This report shows securable objects, the security scopes associated with the objects, and which administrative users have rights to the objects. This report shows security roles and which Configuration Manager administrative users are associated with each security role. This report shows security scopes and which Configuration Manager administrative users and security groups are associated with each security scope. This report displays a summary of those alerts that were generated most often from today back to the specified date for the specified feature area. This reports provides an asset manager summary view of a collection of computers. This report lists users and the count of computers on which they are the primary user. List all computers for which a specified user is the primary console user. Lists computers that do not seem to have a primary user because no one user has a % console login time greater than 66%. The report displays all of the console users on a specific computer. This report helps administrators identify systems that need to have security logging turned on. This report groups the USB devices by their manufacturer. This report groups the USB devices by their manufacturer and description. Displays all the computers with a given USB device. This report lists all the USB devices on a specific computer. This report shows hardware that does not meet the minimum hardware requirements. This reports provides an asset manager summary of computers matching keyword filters on computer name, ConfigMgr site, domain, top console user, operating system, manufacturer, or model. Displays a list of computers in a specified collection where a hardware class has changed during a specified timeframe. Displays the classes that have changed on a specified computer within a specified timeframe. (Change Type: A=All, I=Insert, U=Update, D=Delete). Displays an inventory of all Microsoft software titles that are available from the Microsoft Volume Licensing program. Channel Code: 0=Full Packaged Product, 1=Compliance Checked Product, 2=OEM, 3=Volume, 6=MSDN. Because of complex dependencies and limitations, we cannot guarantee that the licensing information or the number of software installations is accurate. Do not rely solely on these reports to determine your license compliance. This report identifies sales channel for inventoried Microsoft Volume License software. Channel Code: 0=Full Packaged Product, 1=Compliance Checked Product, 2=OEM, 3=Volume, 6=MSDN. Any other value is undefined. The inventoried quantity shown represents the total installed instances discovered for each product. Accuracy of install quantities and license information may vary given complex dependencies and limitations. This report identifies which computers have a specific item from the Microsoft Volume license ledger. Channel Code: 0=Full Packaged Product, 1=Compliance Checked Product, 2=OEM, 3=Volume, 6=MSDN. Any other value is undefined. Accuracy of install quantities and license information may vary given complex dependencies and limitations. Do not rely solely on these reports for determining your license compliance. This report identifies all Microsoft Volume license ledger items on a specific computer. Channel Code: 0=Full Packaged Product, 1=Compliance Checked Product, 2=OEM, 3=Volume, 6=MSDN. Any other value is undefined. Accuracy of install quantities and license information may vary given complex dependencies and limitations. Do not rely solely on these reports for determining your license compliance. The products listed here are those which have their licenses managed by the Software Licensing Service. Accuracy of install quantities and license information may vary given complex dependencies and limitations. Do not rely solely on these reports for determining your license compliance. This report will show the specific computers that are nearing expiration. License Status: 0=Unlicensed, 1=Licensed, 2=Out of Box Grace, 3=Out of Tolerance Grace/Expiration Period, 4=Non-Genuine Grace, 5=Notification, 6=Extended Grace. Accuracy of install quantities and license information may vary given complex dependencies and limitations. Do not rely solely on these reports for determining your license compliance. The products listed here are those which have their licenses managed by the Software Licensing Service. License Status: 0=Unlicensed, 1=Licensed, 2=Out of Box Grace, 3=Out of Tolerance Grace/Expiration Period, 4=Non-Genuine Grace, 5=Notification, 6=Extended Grace. Accuracy of install quantities and license information may vary given complex dependencies and limitations. Do not rely solely on these reports for determining your license compliance. Lists computers acting as Key Management Servers. Accuracy of install quantities and license information may vary given complex dependencies and limitations. Do not rely solely on these reports for determining your license compliance. This report provides the number of processors on computers using Microsoft products that support per-processor licensing. Accuracy of install quantities and license information may vary given complex dependencies and limitations. Do not rely solely on these reports for determining your license compliance. This report provides a list of computers where a specific Microsoft product that supports per-processor licensing is installed. Accuracy of install quantities and license information may vary given complex dependencies and limitations. Do not rely solely on these reports for determining your license compliance. This report provides reconciliation on software licenses purchased through Microsoft Volume License Agreement and the actual inventory count. Accuracy of install quantities and license information may vary given complex dependencies and limitations. Do not rely solely on these reports for determining your license compliance. This report displays Microsoft software titles in use that are not found in the Microsoft Volume License Agreement. Accuracy of install quantities and license information may vary given complex dependencies and limitations. Do not rely solely on these reports for determining your license compliance. This report provides reconciliation on general software licenses purchased and the actual inventory count. Accuracy of install quantities and license information may vary given complex dependencies and limitations. Do not rely solely on these reports for determining your license compliance. This report lists computers which installed the licensed product with a specific version. This report provides a summary of installed software ordered by the number of instances found from inventory. This report lists the product families and the count of software in the family for a specific collection. This report lists the product categories in a specific product family and the count of software within the category. This report is linked to Software 02C – Software in a specific product family and category. This report lists all software that is in the specified product family and category. This report is linked to Software 06B – Software by product name. This report lists all computers with specific software installed. This report is linked to Software 02E – Installed software on a specific computer . This report lists all software installed on a specific computer. This report lists the software that is either categorized as unknown or has no categorization. Displays a list of software configured to automatically run on computers. Displays all computers with specific software configured to automatically run. Displays installed software configured to automatically run on a specific computer. This report displays the Browser Helper Objects installed on computers in a specific collection. Displays all of the computers with a specific Browser Helper Object. Displays all Browser Helper Objects on the specific computer. This report provides a summary of installed software ordered by the number of instances based on search criteria for the product name, publisher, or version. This report provides a summary of installed software ordered by the number of instances based on selected Product Name. This report displays executable programs that have been used recently with a count of computers on which they have been used. The Software Metering client must be enabled for this site to view this report. This report displays the computers on which a specified executable program has recently been used when you enable the software metering client setting. This report displays executables that have been used recently on a specified computer when you enable the software metering client setting. This report displays executable programs that have been used recently with a count of users that have most recently used them when you enable the software metering client setting. This report displays the users that have most recently used a specified executable program when you enable the software metering client setting. This report displays executable programs that have been used recently by a specified user when you enable the software metering client setting. This report displays software titles that have not been used during a specified period of time. You can specify a value that will represent the number of days that have elapsed since the last use (e.g. if you enter 90 days, you will see software that was not used in the past 90 days or more). You can also leave the Days not used field empty to see all software titles that were never used. This report displays computers which have software installed that has not been used for a specified period of time. The specified period of time is based on the value specified in the ‘Software 09A – Infrequently used software’ report. This report allows you to view software titles based on matching of all selected custom label criteria. Up to three custom labels can be selected to refine a software title search. This report shows all computers in this collection, that have the specified custom-labeled software title installed. This report allows you to view software titles based on matching of at least one of the selected custom label criteria. This report displays all software titles that do not have a custom label defined. This report provides the count of installed software with a software identification tag enabled. This report lists all computers that have installed software with a specific software identification tag enabled. This report lists all installed software with a specific software identification tag enabled on a specific computer. This report provides a detailed status of the client push installation process for all sites. For additional client installation status information, see reports under “Site – Client Information”. This report provides a detailed status of the client push installation process for a specified site. For additional client installation status information, see reports under “Site – Client Information”. This report provides a summary view of the client push installation process for all sites. For additional client installation status information, see reports under “Site – Client Information”. This report provides a summary view of the client push installation process for a specified site. For additional client installation status information, see reports under “Site – Client Information”. This report provides client remediation details for a given collection. This report provides remediation summary for a given collection. Looking for a SQL (software metering sccm2012) query which can return last usage time related to specific executable (from SCCM database) for which rule is enabled. I don’t have anything ready. What you may can do is ..edit the existing reports ..and that may help.